Home to one of the world's oldest tropical rainforests, Malaysia is rich in biodiversity. Lush green trees stretch wide across the rolling hills and valleys, towering high majestically as if determined to reach the clouds. But beneath the leafy canopy, lies a sinister darkness. It is a struggle for survival between the species - roots dig deep in search of water and nutrients, branches overlap each other to gain ascendancy for more sunlight. As Charles Darwin would put it, only the fittest will survive. Home to a melting pot of races, Malaysia is also rich in social diversity. Malays, Chinese and Indians make up the three predominant races in Peninsular Malaysia, whilst a myriad of ethnic natives populate East Malaysia. All races have co-existed rather peaceably for centuries, safe from the terrible strife that still ravages Middle East, Africa, South-Asia, and to a lesser extent, Eastern Europe. But beneath the surface of stability, lies racial hostilities. As Selina Kyle would put it, there's a storm coming. The "Allah" cases needs no introduction. Essentially, the government banned the word "Allah" from being used in "Herald", a Christian newsletter circulated countrywide. Initially, the High Court quashed the government's action. But on 14 October 2013, the Court of Appeal reversed the order and found that it was within the government's power to invoke such a ban. At first blush, the crisis seems to stem from religious sensitivities. But it's not. It's really about racial sensitivities. And even the Court of Appeal judges think so, too. "...it seems that the restriction of proselytism has more to do with the preservation of public order than with religious priority." "Under Article 11(4) of the Federal Constitution, non-Muslim may be forbidden by State law from preaching their religion to Muslim... It's aim is to insulate Muslims against a clearly unequal and disadvantegeous situation. During the colonial era, many non-indigenous religions were vigorously promoted by the merchants, the military and the missionaries of the colonial countries. Even today, the proselytizing activities of many Western-dominated religious movements that are internationally organised and funded have aroused resentment in many Asian and African societies... To [Professor Andrew Harding's] view, one may add that Malays see an inseparable connection between their race and their religion. Any attempt to weaken a Malay's religious faith may be perceived as an indirect attempt to erode Malay power. Conversion out of Islam would automatically mean deserting the Malay community due to the legal fact that the definition of a 'Malay' in Article 160(2) of the Federal constitution contains four ingredients. Professing the religion of Islam is one of them." "With the above historical and religious fact, I could not find any plausible reason as to why the respondent is adamant on using the word "Allah" in its weekly newsletter, particularly in its Malay version. Since "Allah" is never an integral part of the faith of the respondent, it is reasonable to conclude that the intended usage will cause unnecessary confusion with the Islamic community and is surely not conducive to the peaceful and harmonious tempo of life in the country. This conclusion is fortified by the fact that the majority in this country is Malay and whose religion is Islam. A fortiori, under Article 160 of the Federal Constitution, a "Malay" is defined as "a person who professes the religion of Islam, habitually speaks the Malay language, ..."
No other Muslim country goes through this crisis. Arab Muslims do not forbid Arab Christians from using the word "Allah", and neither do Indonesians. It is the Malay groups (i.e. Perkasa), rather than Muslim groups, who champion the government's ban. The leaders of PAS, the conservative Islamic political party, see this as a non-issue manipulated by politicians to fish for racial support. Typically, most political observers cite the real motive behind the ban as politics, and the real culprits as politicians (especially those from UMNO, the Malay-based political party forming the backbone of Barisan Nasional, the tripartite ruling coalition). This may be true. But that's ignoring the elephant in the room. Politicians say the silliest things and take up the silliest causes, but they do so because it will (or think it will) win the hearts and minds of their supporters. There's no smoke without fire. Politicians don't simply cook up a storm out of nothing. There is already a storm brewing in the horizon. They simply rode the storm to gain extra political mileage. The point is, it is not only the UMNO politicians who are celebrating the outcome of the Court of Appeal's decision. Many average Malays also are. Politicians come and go, but political ideals don't. Today, you can remove a racist politician from leadership. But tomorrow, a new one will rise to take his stead. For as long as racial hostilities remain in the substratum of society, racial politics will continue to subsist. There is fire, and the fire is real. The "Allah" ban epitomises the racial inequity in Malaysian society. On one side, there is a group that strongly believes that the earth - that is, including everything lying underground and floating up in the air (even spoken words) - belongs to them. Whilst they acknowledge there are other people settling on the same land, they see these people as mere tenants. And they proudly call themselves as "Bumiputeras", which means "Prince of the Soil" in English. To a certain degree, the Court of Appeal judges were right: The supremacy of the Malays forms a fundamental part of the 'social contract' in the founding of Malaysia, and clearly encapsulated in the Federal Constitution - the supreme law of our land. This is Malaysia's past, carrying on to the present. 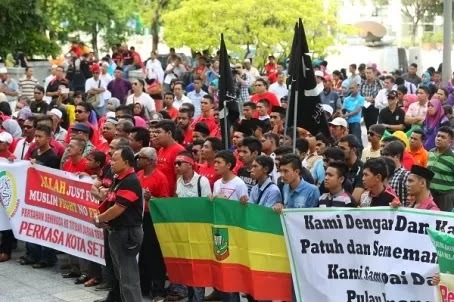 In Malaysia, racial inequity is the natural state of things, just like how a rainforest is a wild and ruthless jungle, where trees fight to usurp the space of their neighbours. But nature can evolve, can it not? Okay, no pushing. There's enough space and sunlight for everyone. Malaysian politics has always been about racial interests. The membership of UMNO, MCA and MIC in Barisan Nasional are open exclusively for Malays, Chinese and Indians respectively. Pakatan Rakyat, the opposition coalition fares slightly better, but not much - PAS is exclusively for Muslims, DAP is dominated by Chinese and Indians, and PKR still maintains a strong Malay power base despite having taken some positive steps to absorb non-Malays into its core leadership team (most of its founding leaders, including Anwar Ibrahim, were former UMNO members). This has to change. The longer our leaders remain huddled in racial tribes, the longer society will be divided along racial lines. Politics must be driven by ideology, not culture. That is not to say different ideologies do not clash - but when they do, the debate is grounded on rational principles, less on irrational emotions. Today, our educational system remains as divided, if not more, since the colonial days. The Malays have their Islamic schools and special Malay colleges. Chinese and Indian parents prefer to send their children to vernacular schools - due to a mixture of doubt in the quality of education in national schools and desire to keep their children closer to their cultural roots. In the past, English medium schools provided an avenue for students of all races to learn in English - they exist no longer. The government's ever-shifting stance on the use of English to teach Science subjects reflects society's unwillingness to get out their linguistic comfort zones. Both are opportunities missed - what better way to promote equality and fairness in education than to use a language which is native to none of the Malaysian races? Race comes first, before nationality. That's exactly how Muhyiddin Yasin, the present Deputy Prime Minister, exhorts Malaysians to see themselves as. As outrageous as it may sound, the prevailing evidence in our societal setup show that many of us actually do. In Malaysia, there is diversity, but without unity. Like the trees of our rainforests, every race fights for itself. Every race wants to have it all their way, and give nothing away. Unity can happen. It's just a matter of each race settling for less personal space, instead of asking for more. We should focus on what makes us similar, instead of what makes us different. Unity can happen. It's just a matter of collective will. Even the trees know this. Two futures for Malaysia. Pick one, people.